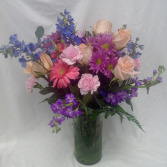 Not one but two dozen roses are center stage in this classic combination of baby's breath, salal and tree fern complete with an irresistible plush bear, a large box of delicious chocolates and three festive balloons. 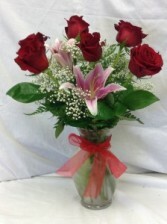 6 gorgeous Roses arranged with greenery and fresh lilies. Perfect to show someone you love them. 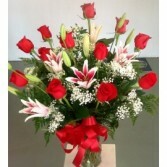 Choose from traditional red or call us to ask about our wide variety of colors!